It’s only a baked Vegan New York Cheesecake..♡...It is ultra-rich, decadently creamy, dessert perfection & you absolutely need it in your life….. Put digestive biscuits (or graham crackers) into a food processor with the butter/coconut oil and blend until well combined and in fine crumbs. Press into the bottom of the tin. Make sure it is even and pressed down firmly then refrigerate while you make the filling. Add all the filling ingredients to a blender and blend until completely smooth. Remove base from the fridge and pour the filling in carefully. Bake for about 50 minutes. It should be set well around the edges and have a little bit of a wobble in the middle when done. A few small cracks are ok and will be covered by whatever you toppings you use. Remove and allow to cool then refrigerate for at least 4-5 hours or overnight. 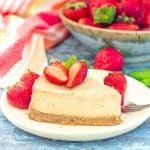 Store in the fridge for freshness, but unlike a lot of vegan cheesecakes it wont melt into a puddle if left at room temperature for a while before serving. If you do not have a deep 9 inch spring form tin then an 8 or a 10 inch will be ok. The cooking time just might need to be adjusted very slightly. Using an 8 inch tin will make it take a little longer as it will be a bit deeper. Probably only 5 or 10 minutes longer though. If you use a 10 inch it will probably be ready a few minutes earlier as it wont be quite as deep. Follow my guide in the instructions for knowing when it is ready. A deep spring form tin is ideal for this recipe. If you do not have one then a tin with a removable bottom will also work. Do not try to make it in a cake pan with no removable bottom as you will never get it out. If you do not have a deep pan then you might need to use a bigger than 9 inch pan in order to fit everything in. If you follow an oil-free diet then you can omit the crust and just cook the cheesecake filling. You can do this in the same way as above but you will need to make absolutely sure that your springform tin is leak proof as it won't have the biscuit layer covering the seams. The last thing you want is for the cheesecake to leak out before it sets up in the oven. Practise with the tin by filling it with water to see if any drips out. If it doesn't you are good to go. If it does then don't use that tin! If you do not have a leak proof tin then you could bake the cheesecake in ramekins. I haven't tried it myself but I would imagine that in small ramekins it would take about 20 - 25 mins in the oven. Follow my instructions above for checking when it is ready.